Give your pal the human-grade nutrition he craves with the Spot Farms Grain-Free Pork Dehydrated Human Grade Dog Food. It’s farm to bowl nutrition for your pooch! Made with dehydrated pork as the first ingredient, plus wholesome ingredients of the same quality you’d find on your plate, including lentils, flaxseeds, apples, spinach, pomegranate and blueberries, it provides a balanced diet that’s chock full of nutrients and bursting with flavor. 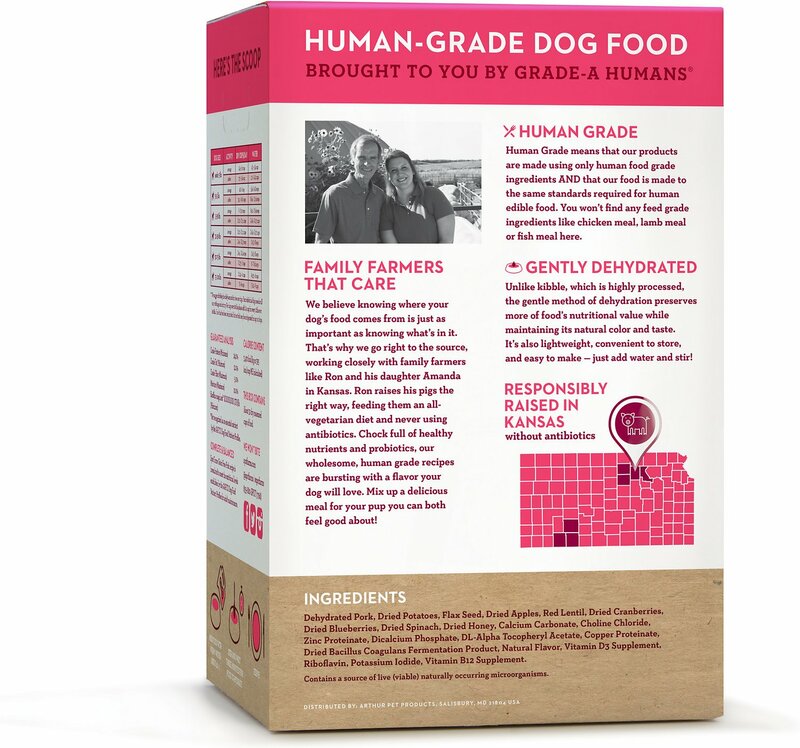 With every bowl, you can trace where your pup’s food came from, like antibiotic-free pork raised on small family farms in Iowa. 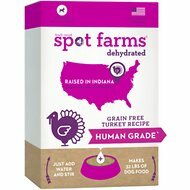 The grain-free formula is easy to mix with plain water and great for pups of all sizes and ages, even the picky eaters. 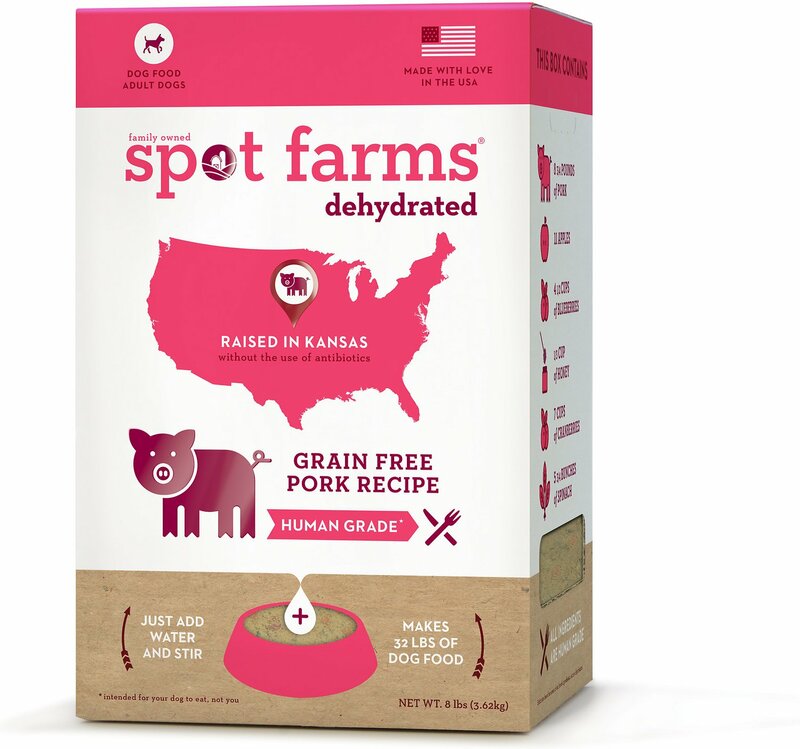 Grain-free formula is made with dehydrated, antibiotic-free pork as the first ingredient that’s raised by family farms in Iowa. Made with human-grade ingredients like lentils, flaxseeds, apples, spinach, pomegranate and blueberries that are traceable to their source for farm-to-bowl nutrition. Made with love in the USA with no grains, wheat, soy, antibiotics, artificial flavors, colors, or preservatives. Dehydrated Pork, Dried Potatoes, Flax Seed, Dried Apples, Red Lentil, Dried Cranberries, Dried Blueberries, Dried Spinach, Dried Honey, Calcium Carbonate, Choline Chloride, Zinc Proteinate, Dicalcium Phosphate, DL-Alpha Tocopheryl Acetate, Copper Proteinate, Dried Bacillus Coagulans Fermentation Product, Natural Flavor, Vitamin D3 Supplement, Riboflavin, Potassium Iodide, Vitamin B12 Supplement. *Measured in Dry per Day. We suggest dividing the daily amount into 2 servings. Your individual dog’s needs will vary with age and activity. For puppies serve up to 50% more than the amounts listed. For pregnant or nursing dogs you may feed up to 2 - 3 times listed amounts. For dogs over 100 lbs please add 1/3 cup for every 10 lbs over 100 lbs. Food that has been rehydrated, but not fed, may be refrigerated for up to 2 days. Very pleased with this food! Easy to prepare, powder consistency turns to glob of goodness for my hounds, they really love it judging on how they gobbled it up when serve. Both of my dogs seem to enjoy the pork. So far Turkey is their favorite. It seems like a quality food and rehydrates VERY well, which leads me to believe this is FULL of potatoes. The side of the box states 4lbs of pork, 1 apple, 1c blueberries, 2.5 bunches of spinach, .25 pomegranate and 2.5 tbsp honey. Now look at the ingredient list, dried potatoes is No 2! Followed by flax seed and red lentils. I’d like to know why they failed to mention, on the side of the box, the lbs of potatoes that it contains. Hmmmmm! He's tried the chicken and turkey, he liked those but he LOVES this pork one. I add a little chopped meat (chicken to the chicken, turkey to the turkey and pork to the pork) and some fresh chopped greens. He LOVES it!! All healthy, and my dogs beg for more! I add it to their kibble in the am, rehydrate, and they spend the next half hour licking any tiny atom they may have missed. Turkey and Chicken is also enjoyed, but Pork- Oh My Gosh!! They would eat a box in one meal if allowed! Their coats are soft and shiny, weight is maintained easily for 3 generations. If you have a picky eater, they will become a Piggy eater with Spots Farms Pork! Both my dogs love this!! I have a 12 year old Goldendoodle and a 1 year old Goldendoodle who were on the Honest Kitchen previously to trying Spot Farms. Both of them love this just as much as they do the Honest Kitchen. I like this because of the value and nutritional content. Would defiantly recommend to anyone I know.